Give your garden a touch of sunshine every day using the Panacea Aztec Sun Garden Trellis. The mix of straight and curved lines, brown color, and significant width on this piece lends a fun look to any setting. An abstract sunburst shape rests near the top of this unit, and the dual arch echoes it. Curved metal rods extend from the sun detail, each ending with an inward curl beneath the arch. 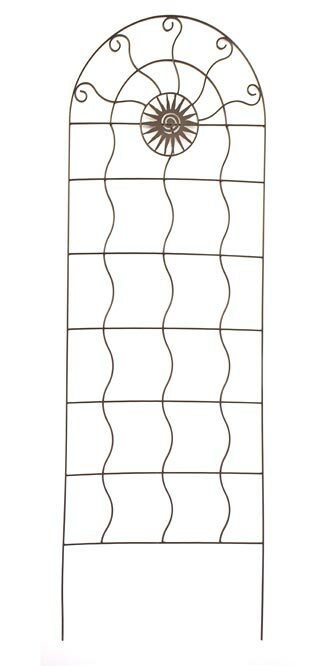 Additional, curved vertical rods bring attention to the body of the trellis, while the soft brown, powder coated finish lends a natural hint to it. Straight horizontal rods intersect the vertical ones, creating support on the unit for your favorite climbing plant. Stake the 11.75" long legs into the soil in your garden, or place the item against a wall for a different effect. Crafted from lasting metal, this piece will certainly brighten your garden for many seasons. Add a lighthearted touch to your landscaping with this Aztec Sun Garden Trellis.